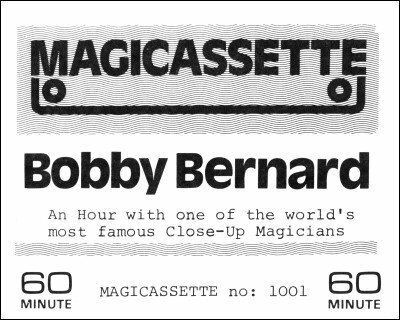 Tricks, memories, advice from this fast-talking genius of magic. The most perfect example of misdirection by John Ramsay is described in detail. This was the very first Martin Breese Magicassette ever produced. It was among the best selling tapes Martin published over many years. And it is now available as immediate and convenient MP3 download. Whether you are a relative beginner or consider yourself an experienced performer, Bobby Bernard's critical experience and teaching ability will offer you a great deal. For the absolute beginner in magic this is the perfect recording. It tells you how to get started in magic but on the right road with details even on the best books to select for your magical reading.